FOR one year Brisbane “streetie” Johnny has woken up on a concrete slab next to a neat cluster of mattresses under the Kurilpa Bridge in South Brisbane. As the sun rises over the Brisbane River, he’ll often receive a friendly wave from one of the local runners passing under the bridge. On Saturdays a group of people hand out food for him and his other streetie mates living under the bridge, many of them from his home country New Zealand. Other days, a food van run by a local charity pays a visit, offering a free meal and friendly conversation. Most of the public will never see this part of Johnny’s daily life, but a local project aimed at sharing the real stories of Brisbane’s homeless could change that. Last month Johnny accepted the challenge to photograph Brisbane as he sees it – under the Kurilpa Bridge – on a disposable Kodak film camera. It’s part of a competition being run by Brisbane “sanctuary” for the homeless, Catholic group Blind Eye Ministries, which operates a drop-in centre for the vulnerable in South Brisbane. 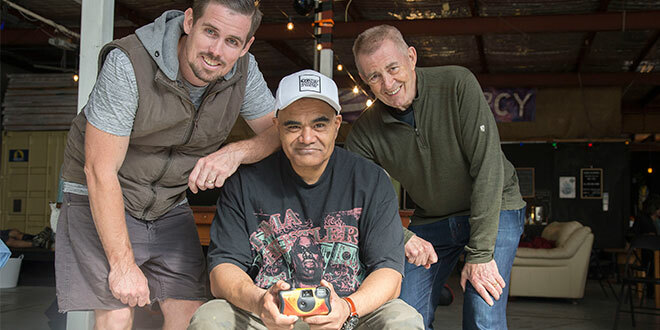 Volunteer Peter McMahon, who is also a photographer, saw a similar project operating in London and wondered if his homeless mates would take up the challenge in Brisbane. He now has the task of sifting through 800 photos to find 13 finalists. After a brief training session, Johnny took his camera out on the streets to capture everything he sees under the bridge in a week. “We all kind of turned into photographers after a little bit,” Johnny said. “We just wanted to take photos of where we stay … we got a photo of us as a group. “We know all sorts of little streeties so we went around and had a little photo with the food vans, sandwich van, and some of the people that give out food for us on a Saturday. “Mainly (it was) just about where we’re staying. One thing you won’t see in Johnny’s photos is a gloomy, dreary face. “I know some of the other streeties, and that, might be doing it a little bit harder, a little bit rough, but we kind of wanted to take photos of how clean we are,” he said. In one month Johnny and the public will see his photographs for the first time when they’re on display at the Blind Eye Centre. Despite having a place to stay at the local men’s homeless shelter, Johnny prefers living under the bridge. “I just wanted to stay under the bridge,” Johnny said. “There’s nothing wrong with it at all. “We do like to show off, we do take everything people give us and we don’t waste it. Blind Eye Ministries director Roby Curtis admitted to being initially sceptical about whether his homeless friends at the centre would get involved. “I was a bit cynical, to be honest,” Mr Curtis said. “So when we had the four orientation sessions where we spoke about the cameras, by the fourth one there were fifty cameras gone out with all details in the system in the database. Mr Curtis said outside the drop-in centre were “a whole lot of labels” but the upcoming photo exhibition would be a chance to see from the eyes of a homeless person. “I love it when you hear the story behind the label because it’s often the story of misfortune, hardship, never having an opportunity from the beginning, never knowing love, whatever it may be,” he said. Johnny, the streetie from under the Kurilpa Bridge, agrees. “My grandmother always told me don’t look down on anyone because in the blink of an eye you can be in the same position,” he said. “I’m just grateful we’ve got people like this, like Roby and them, to come and help us have a shower and that kind of stuff. “It feels like a family here. Blind Eye Ministries’ Life on the Streets photography exhibition will be held in late July and an independent judging panel will select one winner. The ministry hopes to take the exhibition on tour or have it hosted by a local organisation for six months, before publishing a calendar of the photographs next year.